The term stereophonic sound or, more commonly, stereo, refers to any method of sound reproduction in which an attempt is made to create an illusion of directionality and audible perspective. This is usually achieved by using two or more independent audio channels through a configuration of two or more loudspeakers in such a way as to create the impression of sound heard from various directions, as in natural hearing. Thus the term "stereophonic" applies to so-called "quadraphonic" and "surround-sound" systems as well as the more common 2-channel, 2-speaker systems. It is often contrasted with monophonic, or "mono" sound, where audio is in the form of one channel, often centered in the sound field (analogous to a visual field). Stereo sound is now common in entertainment systems such as broadcast radio and TV, recorded music and the cinema. The word stereophonic derives from the Greek "στερεός" (stereos), "firm, solid" + "φωνή" (phōnē), "sound, tone, voice" and it was coined in 1927 by Western Electric, by analogy with the word "stereoscopic". Stereo sound systems can be divided into two forms: The first is "true" or "natural" stereo in which a live sound is captured, with any natural reverberation or ambience present, by an array of microphones. The signal is then reproduced over multiple loudspeakers to recreate, as closely as possible, the live sound. Secondly "artificial" or "pan-pot" stereo, in which a single-channel (mono) sound is reproduced over multiple loudspeakers. By varying the relative amplitude of the signal sent to each speaker an artificial direction (relative to the listener) can be suggested. 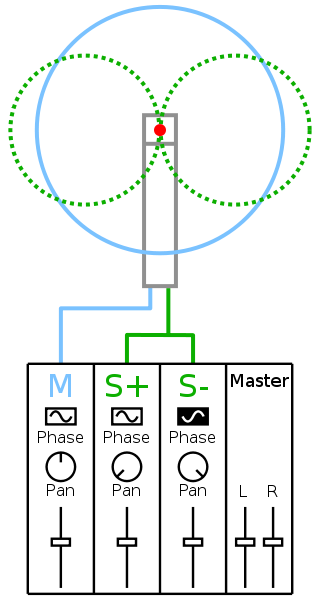 The control which is used to vary this relative amplitude of the signal is known as a "pan-pot" (panoramic potentiometer). By combining multiple "pan-potted" mono signals together, a complete, yet entirely artificial, sound field can be created. In technical usage, true stereo means sound recording and sound reproduction that uses stereographic projection to encode the relative positions of objects and events recorded. During two-channel stereo recording, two microphones are placed in strategically chosen locations relative to the sound source, with both recording simultaneously. The two recorded channels will be similar, but each will have distinct time-of-arrival and sound-pressure-level information. During playback, the listener's brain uses those subtle differences in timing and sound level to triangulate the positions of the recorded objects. Stereo recordings often cannot be played on monaural systems without a significant loss of fidelity. Since each microphone records each wavefront at a slightly different time, the wavefronts are out of phase; as a result, constructive and destructive interference can occur if both tracks are played back on the same speaker. This phenomenon is known as phase cancellation. 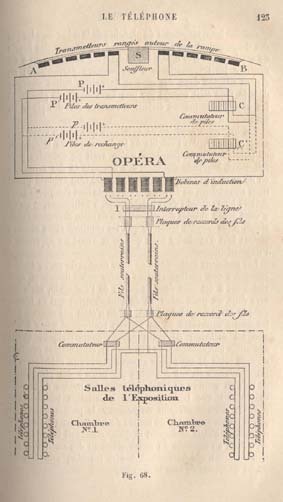 Diagram of Clément Ader's théatrophone prototype at the Opera during the World Exhibition in Paris (1881). "Every one who has been fortunate enough to hear the telephones at the Palais de l'Industrie has remarked that, in listening with both ears at the two telephones, the sound takes a special character of relief and localization which a single receiver cannot produce… This phenomenon is very curious, it approximates to the theory of binauricular audition, and has never been applied, we believe, before to produce this remarkable illusion to which may almost be given the name of auditive perspective." In the 1930s, Alan Blumlein at EMI patented stereo records, stereo films, and also surround sound. The two stereophonic recording methods, using two channels and coincident microphone techniques (X-Y with bidirectional transducers/Blumlein setup + M/S stereophony), were developed by Blumlein at EMI in 1931 and patented in 1933. A stereo disc, using the two walls of the groove at right angles in order to carry the two channels, was cut at EMI in 1933, twenty-five years before that method became the standard for stereo phonograph discs. Harvey Fletcher of Bell Laboratories investigated techniques for stereophonic recording and reproduction. One of the techniques investigated was the "wall of sound", which used an enormous array of microphones hung in a line across the front of an orchestra. Up to 80 microphones were used, and each fed a corresponding loudspeaker, placed in an identical position, in a separate listening room. Several stereophonic test recordings, using two microphones connected to two styli cutting two separate grooves on the same wax disc, were made with Leopold Stokowski and the Philadelphia Orchestra at Philadelphia's Academy of Music in March 1932. The first (made on March 12, 1932), of Scriabin's Prometheus: Poem of Fire, is the earliest known surviving intentional stereo recording. Accidental stereophonic recordings from these years also exist. On some occasions, RCA Victor used two microphones, two amplifiers and two recording lathes to make two simultaneous but completely separate recordings of a performance. Although this may have been done to compare the results obtained with different microphones or other technical variations, the reasons for this procedure have not been definitely established. Normally, only one of the resulting pair of recordings was released, but the other-channel recording was sometimes used for a foreign issue or survived in the form of a test pressing. When such pairs of recordings have been located and matched up, authentic stereophonic sound has been recovered, its character and degree of spatial accuracy dependent on the fortuitous placement of the two microphones and the accurate synchronization of the two recordings. Recovered stereophonic versions of two recordings made in February 1932 by Duke Ellington and His Orchestra have been issued on LP and CD under the title Stereo Reflections in Ellington and are also included in the 22-CD set The Duke Ellington Centennial Edition. Bell Laboratories gave a demonstration of three-channel stereophonic sound on April 27, 1933, with a live transmission of the Philadelphia Orchestra from Philadelphia to Constitution Hall in Washington, D.C. Leopold Stokowski, normally the orchestra's conductor, was present in Constitution Hall to control the sound mix. Bell Labs also demonstrated binaural sound, using a dummy with microphones instead of ears, at the Chicago World's Fair in 1933.The two signals were sent out over separate AM station bands. The Carnegie Hall demonstration by Bell Laboratories on April 9 and 10, 1940, used three huge speaker systems. Synchronization was achieved by making the recordings in the form of three motion picture soundtracks recorded on a single piece of film. Because of dynamic range limitations, volume compression was used, with a fourth track being used to regulate volume expansion. The volume compression and expansion were not fully automatic, but were designed to allow manual studio "enhancement"; i.e., the artistic adjustment of overall volume and the relative volume of each track. The recordings had been made by the Philadelphia Orchestra, conducted by Leopold Stokowski, who was always interested in sound reproduction technology. Stokowski personally participated in the "enhancement" of the sound. The speakers produced sound levels of up to 100 decibels, and the demonstration held the audience "spellbound, and at times not a little terrified", according to one report. Sergei Rachmaninoff, who was present at the demonstration, commented that it was "marvellous" but "somehow unmusical because of the loudness." "Take that Pictures at an Exhibition", he said. "I didn't know what it was until they got well into the piece. Too much 'enhancing', too much Stokowski." In 1937, Bell Laboratories in New York City gave a demonstration of two-channel stereophonic motion pictures, developed by Bell Labs and Electrical Research Products, Inc. Conductor Leopold Stokowski recorded onto a nine-track sound system at the Academy of Music in Philadelphia, during the making of the movie One Hundred Men and a Girl for Universal Pictures in 1937. The tracks were mixed down to one for the final soundtrack. In 1938, Metro-Goldwyn-Mayer started using three tracks instead of one to record movie soundtracks, and very quickly upgraded to four tracks. One track was used for dialogue, two for music, and one for sound effects. The purpose for this form of multitrack recording was to make mixing down to a single optical track easier and was not intended to be a recording for stereophonic purposes. The very first binaural recording MGM made (although released in mono) was "It Never Rains But What It Pours" by Judy Garland, recorded on June 21, 1938, for the movie Love Finds Andy Hardy. Walt Disney began experimenting with multi-channel sound in the early 1930s. The first commercial motion picture to be exhibited with stereophonic sound was Walt Disney's Fantasia, released in November 1940, for which a specialized sound process (Fantasound) was developed. Fantasound used a separate film containing four optical sound tracks. Three of the tracks were used to carry left, center and right audio, while the fourth track carried three tones which individually controlled the volume level of the other three. The film was not a financial success, however, and after two months of road-show exhibition in selected cities, its soundtrack was remixed into mono sound for general release. In the early 1940s, composer-conductor Alfred Newman directed the construction of a sound stage equipped for multichannel recording for 20th Century Fox studios. Several soundtracks from this era still exist in their multichannel elements, some of which have been released on DVD, including How Green Was My Valley, Anna and the King of Siam, Sun Valley Serenade, and The Day the Earth Stood Still. The advent of magnetic tape recording made high fidelity synchronized multichannel recording technically straightforward, though costly. By the early 1950s, all of the major studios were recording on 35mm magnetic film for mixing purposes. Motion picture theatres, however, are where the real introduction of stereophonic sound to the public occurred. Stereo sound was proven viable with the release of This is Cinerama on September 30, 1952. Cinerama was a spectacular widescreen process in some ways comparable to today's IMAX. Cinerama's audio soundtrack utilized seven discrete magnetic sound tracks: five behind the screen, plus two surround channels. The system was developed by Hazard E. Reeves, a pioneer in magnetic recording technology. By all accounts (including accounts by those who have experienced the process in rare recent showings), the sound was as spectacular as the picture, even excellent, by modern standards. In April 1953, while This is Cinerama was still playing only in New York City, most moviegoing audiences heard stereophonic sound for the first time with the Warner Bros. 3-D film production of House of Wax, starring Vincent Price. The sound system, WarnerPhonic, was a combination of a 35 mm magnetic full-coat that contained Left-Center-Right, interlocked with the two dual-strip Polaroid system projectors, one of which carried an optical surround track and one that carried a mono backup track, should anything go wrong. Only two other films carried WarnerPhonic sound: the 3-D production of The Charge at Feather River, and Island in the Sky. The magnetic tracks to these films are considered lost. A large percentage of 3-D films carried variations on three-track magnetic sound. Among them were It Came from Outer Space; I, the Jury; The Stranger Wore a Gun; Inferno; Kiss Me, Kate; and many others. Inspired by Cinerama, the movie industry moved quickly to create simpler and cheaper widescreen systems, such as Twentieth Century-Fox Film Corporation's CinemaScope, which used up to four magnetic sound tracks. Because of the standard 35 mm-size film, CinemaScope and its stereophonic sound was capable of being retrofitted into existing theaters. CinemaScope 55 was created by the same company in order to use a larger form of the system (55 mm instead of 35 mm), and was supposed to have had 6-track stereo. However, because the film needed a new, specially designed projector, the system proved impractical, and the two films made in it, Carousel and The King and I, were released in 35 mm CinemaScope reduction prints. To compensate, the premiere engagement of Carousel used a six-track magnetic full-coat in an interlock, and a 1961 re-release of The King and I, with the film "blown up" to 70 mm, also used a six-track stereo soundtrack. However, 50 complete sets of combination 55/35 mm projectors and "penthouse" reproducers were eventually completed and delivered by Century and Ampex, respectively. 55 mm release print sounding equipment was delivered by Western Electric and samples of sounded 55 mm prints are on file in the Sponable Collection at Columbia University. The subsequently abandoned 55/35 mm Century projector eventually became the Century JJ 70/35 mm projector. After this disappointing experience with a proprietary "wide gauge" system, Fox purchased the Todd-AO system and re-engineered it into a more modern 24 fps system with brand-new 65 mm self-blimped production cameras (Mitchell BFC ... "Blimped Fox Camera") and brand-new 65 mm MOS cameras (Mitchell FC ... "Fox Camera") and brand-new Super Baltar lenses in a wide variety of focal lengths, first employed on South Pacific. Essentially, Todd-AO became Fox's premier origination and presentation system, replacing CinemaScope 55, although the Todd-AO system was also available to others. Current DVDs of the two CinemaScope 55 feature titles were transferred from the original 55mm negatives. However, beginning in 1957, films recorded in stereo (except for those shown in Cinerama) carried an alternate mono track for theatres not ready or willing to re-equip for stereo. From then until about 1975, when Dolby Stereo was used for the first time in films, most motion pictures—even some from which stereophonic soundtrack albums were made, such as Zeffirelli's Romeo and Juliet—were still released in monaural sound, stereo being reserved almost exclusively for expensive musicals such as West Side Story, My Fair Lady, or Camelot; epics such as Ben-Hur or Cleopatra; or dramas with a strong reliance on sound effects or music, such as The Graduate, with its Simon and Garfunkel score. Today, virtually all films are released in stereophonic sound as 1977's Westrex Stereo Variable-Area system is no more expensive to manufacture than mono (it employs the same recorder, the Western Electric/Westrex/Nuoptix RA-1231), and with Dolby Labs' matrixing technology (actually licensed from Sansui) this S V-A system can produce the Left, Center, Right and Surround sound of 1953's CinemaScope system using a standard width optical track. This important development finally brought stereo sound to so-called Flat Wide-Screen (preferentially 1.85:1, but sometimes 1.75:1 or 1.66:1) theatrical productions. Producers often took advantage of the six magnetic soundtracks in 70mm film, and productions shot in 65 mm (or 35 mm and then blown up to 70 mm) would be mixed for stereo, while the 35mm reduction prints would be remixed for mono. Some films shot in 35mm, such as Camelot, featured four-track stereophonic sound and were then "blown-up" to 70mm so that they could be shown on a giant screen with six-track stereophonic sound, but many were pseudo six-track as the "Columbia Spread" was often used to synthesize Left Center and Right Center from a combination of Left and Center and Right and Center, respectively, or, for effects, the effect could be "panned" anywhere across the five stage speakers using a one-in/five-out pan pot. From 1940 to 1970, the progress of stereophonic sound was paced by the technical difficulties of recording and reproducing two or more channels in synchronization and by the economic and marketing issues of introducing new audio media and equipment. A stereo system cost roughly twice as much as a monophonic system, since a stereo system had to be assembled by buying two preamplifiers, two amplifiers, and two speaker systems. It was not clear whether consumers would think the sound was so much better as to be worth twice the price. In 1952, Emory Cook (1913–2002), who already had become famous by designing new feedback disk-cutter heads to improve sound from tape to vinyl, developed a "binaural" record. This record consisted of two separate channels, cut into two separate grooves running next to each other. Each groove needed a needle, and each needle was connected to a separate amplifier and speaker. This setup was intended to give a demonstration at a New York audio fair of Cook's cutter heads rather than to sell the record; but soon afterward, the demand for such recordings and the equipment to play it grew, and Cook Records began to produce such records commercially. Cook recorded a vast array of sounds, ranging from railroad sounds to thunderstorms. By 1953, Cook had a catalog of about 25 stereo records for sale to audiophiles. Stereo magnetic tape recording, using two recording and playback heads on standard 1/4-inch tape, was demonstrated in 1952. In 1953, Remington Records began taping some of its sessions in stereo, including performances by Thor Johnson and the Cincinnati Symphony Orchestra. Later that year, RCA Victor conducted some experimental stereo tapings with Leopold Stokowski and a group of New York musicians. In February 1954, RCA taped the Boston Symphony Orchestra, conducted by Charles Münch, in a performance of Berlioz' Damnation of Faust, which led to regular stereo tapings by the company. Shortly afterwards, conductor Arturo Toscanini's last two public concerts were recorded on stereophonic magnetic tape. They were, however, not released in stereo until 1987 and 2007, respectively. In the UK, Decca Records began taping in stereo in mid-1954. In 1954, companies such as Concertapes and RCA Victor began releasing stereophonic recordings on two-track prerecorded reel-to-reel magnetic tape, priced at twice the cost of monaural recordings. Audiophiles bought them, and stereophonic sound came to at least some living rooms. Stereo recording became widespread in the music business by the 3rd quarter of 1957. Label and sleeve from Audio Fidelity Records' second stereo demonstration record, ca. 1958. 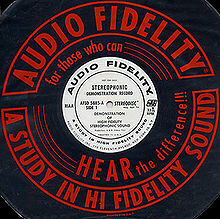 The small record label Audio Fidelity Records released the first mass-produced stereophonic disc in November 1957. Sidney Frey, founder and president, had Westrex (owners of one of the two rival stereo disk-cutting systems) cut a disk for release before any of the major record labels. Side 1 was the Dukes of Dixieland, and Side 2 was railroad sound effects. This demonstration disc was introduced to the public on December 13, 1957 at the Times Auditorium in New York City 500 copies of this initial demonstration record were pressed. Three days later, Frey advertised in the trade magazine Billboard that he would send a free copy to anyone in the industry who wrote to him on company letterhead. That move generated a great deal of publicity.Dealers in stereo phonograph equipment had no choice but to demonstrate on Audio Fidelity Records. After the release of the demonstration disc, the other spur to the popularity of stereo discs was the reduction in price of a stereo magnetic cartridge, for playing the disks, from $250 to $29.95 in June 1958. The first four mass-produced stereophonic discs available to the buying public were released in March, 1958—Johnny Puleo and his Harmonica Gang Volume 1 (AFSD 5830), Railroad – Sounds of a Vanishing Era (AFSD 5843), Lionel – Lionel Hampton and his Orchestra (AFSD 5849) and Marching Along with the Dukes of Dixieland Volume 3 (AFSD 5851). By the end of March, the company had four more stereo LPs available. By 1968, the major record labels stopped making monaural discs. Radio: In December 1925, the BBC's experimental transmitting station, 5XX, in Daventry, Northamptonshire, made radio's first stereo broadcast—a concert from Manchester, conducted by Sir Hamilton Harty—with 5XX broadcasting the right channel nationally by long wave and local BBC stations broadcasting the left channel by medium wave. The BBC repeated the experiment in 1926, using 2LO in London and 5XX at Daventry. Following experimental FM stereo transmissions in the London area in 1958 and regular Saturday morning demonstration transmissions using TV sound and medium wave (AM) radio to provide the two channels, the first regular BBC transmissions using an FM stereo signal began on the BBC's Third Programme network on August 28, 1962. Chicago AM radio station WGN (and its sister FM station, WGNB) collaborated on an hourlong stereophonic demonstration broadcast on May 22, 1952, with one audio channel broadcast by the AM station and the other audio channel by the FM station. New York City's WQXR initiated its first stereophonic broadcasts in October 1952, and by 1954, was broadcasting all of its live musical programs in stereophonic sound, using its AM and FM stations for the two audio channels. Rensselaer Polytechnic Institute began a weekly series of live stereophonic broadcasts in November 1952 by using two campus-based AM stations, although the listening area did not extend beyond the campus. Tests of six competing FM-only systems were conducted on KDKA-FM in Pittsburgh, Pennsylvania during July and August 1960. The Federal Communications Commission announced stereophonic FM technical standards in April 1961, with licensed regular stereophonic FM radio broadcasting set to begin in the United States on June 1, 1961.WEFM (in the Chicago area) and WGFM (in Schenectady, New York) were reported as the first stereo stations. Television: A December 11, 1952 closed-circuit television performance of Carmen, from the Metropolitan Opera House in New York City to 31 theaters across the United States, included a stereophonic sound system developed by RCA. The first several shows of the 1958–59 season of The Plymouth Show (AKA The Lawrence Welk Show) on the ABC (America) network were broadcast with stereophonic sound in 75 media markets, with one audio channel broadcast via television and the other over the ABC radio network. By the same method, NBC Television and the NBC Radio Network offered stereo sound for two three-minute segments of The George Gobel Show on October 21, 1958. On January 30, 1959, ABC's Walt Disney Presents made a stereo broadcast of The Peter Tchaikovsky Story—including scenes from Disney's latest animated feature, Sleeping Beauty—by using ABC-affiliated AM and FM stations for the left and right audio channels. With the advent of FM stereo in 1961, a small number of music-oriented TV shows were broadcast with stereo sound using a process called simulcasting, in which the audio portion of the show was carried over a local FM stereo station. In the 1960s and 1970s, these shows were usually manually synchronized with a reel-to-reel tape delivered by mail to the FM station (unless the concert or music was locally originated). In the 1980s, satellite delivery of both television and radio programs made this fairly tedious process of synchronization unnecessary. One of the last of these simulcast programs was Friday Night Videos on NBC, just before MTS stereo was approved by the FCC. The BBC made extensive use of simulcasting between 1974 and around 1990. The first such transmission was in 1974, when the BBC broadcast a recording of Van Morrison's London Rainbow Concert simultaneously on BBC2 TV and Radio 2. After that it was used for many other music programmes, live and recorded, including the annual BBC Promenade concerts and the Eurovision Song Contest. The advent of NICAM stereo sound with TV rendered this unnecessary. Cable TV systems delivered many stereo programs utilizing this method for many years until prices for MTS stereo modulators dropped. One of the first stereo cable stations was The Movie Channel, though the most popular cable TV station that drove up usage of stereo simulcasting was MTV. Japanese television began multiplex (stereo) sound broadcasts in 1978, and regular transmissions with stereo sound came in 1982. By 1984, about 12% of the programming, or about 14 or 15 hours per station per week, made use of the multiplex technology. West Germany's second television network, ZDF, began offering stereo programs in 1984. In 1979, The New York Times reported, "What has prompted the industry to embark on establishing high-fidelity standards now, according to engineering executives involved in the project, is chiefly the rapid march of the new television technologies, especially those that are challenging broadcast television, such as the video disk." Multichannel television sound, better known as MTS (often still as BTSC, for the Broadcast Television Systems Committee that created it), is the method of encoding three additional channels of audio into an NTSC-format audio carrier. It was adopted by the FCC as the United States standard for stereo television transmission in 1984. Sporadic network transmission of stereo audio began on NBC on July 26, 1984, with the Tonight Show—although at the time, only the network's New York City flagship station, WNBC, had stereo broadcast capability. Regular stereo transmission of programs began in 1985. This uses two parallel omnidirectional microphones some distance apart, capturing time-of-arrival stereo information as well as some level (amplitude) difference information—especially if employed in close proximity to the sound source(s). At a distance of about 60 cm (231⁄2 inches), the time delay (time-of-arrival difference) for a signal reaching the first microphone and then the other one from the side is approximately 1.5 msec (1 to 2 msec). If you increase the distance between the microphones, you effectively decrease the pickup angle. At a 70 cm (271⁄2 inches) distance, it is approximately equivalent to the pickup angle of the near-coincident ORTF setup. This technique can produce phase issues when the stereo signal is mixed to mono. 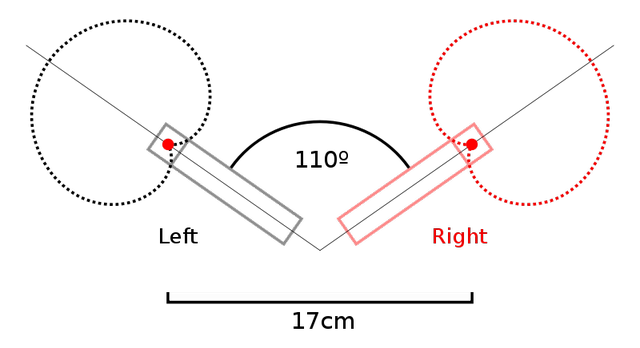 Here, two directional microphones are at the same place, typically pointing at an angle between 90° and 135° to each other.The stereo effect is achieved through differences in sound pressure level between two microphones. 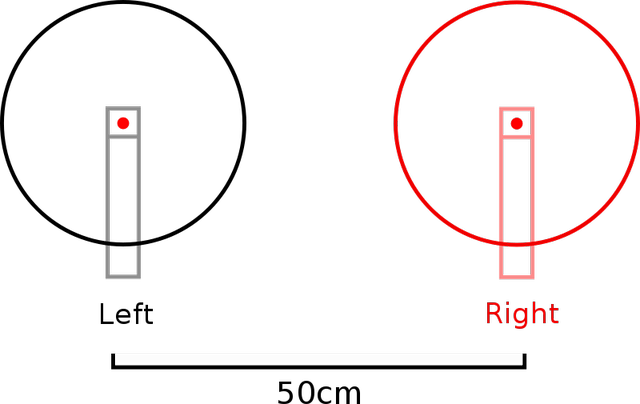 A difference in levels of 18 dB (16 to 20 dB) is needed for hearing the direction of a loudspeaker. Due to the lack of differences in time-of-arrival/phase ambiguities, the sonic characteristic of X-Y recordings has less sense of space and depth when compared to recordings employing an A-B setup. When two figure-eight microphones are used, facing ±45° with respect to the sound source, the X-Y setup is called a Blumlein Pair. The sonic image produced is realistic, almost "holographic". 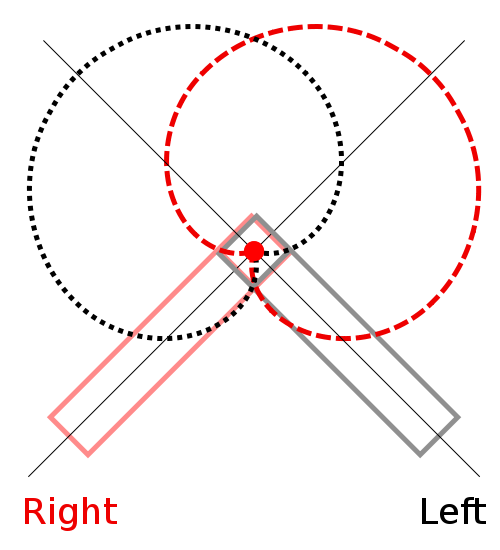 This coincident technique employs a bidirectional microphone facing sideways and another microphone at an angle of 90°, facing the sound source. The second microphone is generally a variety of cardioid, although Alan Blumlein described the usage of an omnidirectional transducer in his original patent. The left and right channels are produced through a simple matrix: Left = Mid + Side; Right = Mid − Side (the polarity-reversed side signal). This configuration produces a completely mono-compatible signal and, if the Mid and Side signals are recorded (rather than the matrixed Left and Right), the stereo width can be manipulated after the recording has taken place. This makes it especially useful for film-based projects. These techniques combine the principles of both A-B and X-Y (coincident pair) techniques. For example, the ORTF stereo technique of the Office de Radiodiffusion Télévision Française (Radio France) calls for a pair of cardioid microphones placed 17 cm apart at a total angle between microphones of 110°, which results in a stereophonic pickup angle of 96° (Stereo Recording Angle, or SRA). In the NOS stereo technique of the Nederlandse Omroep Stichting (Holland Radio), the total angle between microphones is 90° and the distance is 30 cm, thus capturing time-of-arrival stereo information as well as level information. It is noteworthy that all spaced microphone arrays and all near-coincident techniques use a spacing of at least 17 cm or more. 17 cm roughly equals the human ear distance and therefore provides the same interaural time difference (ITD) or more, depending on the spacing between microphones. Although the recorded signals are generally intended for playback over stereo loudspeakers, reproduction over headphones can provide remarkably good results, depending on the microphone arrangement. In the course of restoration or remastering of monophonic records, various techniques of "pseudo-stereo", "quasi-stereo", or "rechanneled stereo" have been used to create the impression that the sound was originally recorded in stereo. These techniques first involved hardware methods (see Duophonic) or, more recently, a combination of hardware and software. Multitrack Studio, from Bremmers Audio Design (The Netherlands), uses special filters to achieve a pseudo-stereo effect: the "shelve" filter directs low frequencies to the left channel and high frequencies to the right channel, and the "comb" filter adds a small delay in signal timing between the two channels, a delay barely noticeable by ear, but contributing to an effect of "widening" original "fattiness" of mono recording. The special pseudo-stereo circuit—invented by Kishii and Noro, from Japan—was patented in the United States in 2003, with already previously issued patents for similar devices. Artificial stereo techniques have been used to improve the listening experience of monophonic recordings or to make them more "saleable" in today's market, where people expect stereo. Some critics have expressed concern about the use of these methods. For more details on this topic, see Binaural recording. Engineers make a technical distinction between "binaural" and "stereophonic" recording. Of these, binaural recording is analogous to stereoscopic photography. In binaural recording, a pair of microphones is put inside a model of a human head that includes external ears and ear canals; each microphone is where the eardrum would be. The recording is then played back through headphones, so that each channel is presented independently, without mixing or crosstalk. Thus, each of the listener's eardrums is driven with a replica of the auditory signal it would have experienced at the recording location. The result is an accurate duplication of the auditory spatiality that would have been experienced by the listener had he or she been in the same place as the model head. Because of the inconvenience of wearing headphones, true binaural recordings have remained laboratory and audiophile curiosities. However "loudspeaker-binaural" listening is possible with Ambiophonics. Stereophonic sound attempts to create an illusion of location for various sound sources (voices, instruments, etc.) within the original recording. The recording engineer's goal is usually to create a stereo "image" with localization information. When a stereophonic recording is heard through loudspeaker systems (rather than headphones), each ear, of course, hears sound from both speakers. The audio engineer may, and often does, use more than two microphones (sometimes many more) and may mix them down to two tracks in ways that exaggerate the separation of the instruments, in order to compensate for the mixture that occurs when listening via speakers. Descriptions of stereophonic sound tend to stress the ability to localize the position of each instrument in space, but this would only be true in a carefully engineered and installed system, where speaker placement and room acoustics are taken into account. In reality, many playback systems, such as all-in-one boombox units and the like, are incapable of recreating a realistic stereo image. Originally, in the late 1950s and 1960s, stereophonic sound was marketed as seeming "richer" or "fuller-sounding" than monophonic sound, but these sorts of claims were and are highly subjective, and again, dependent on the equipment used to reproduce the sound. In fact, poorly recorded or reproduced stereophonic sound can sound far worse than well done monophonic sound. When playing back stereo recordings, the best results are obtained by using two identical speakers, in front of and equidistant from the listener, with the listener located on a center line between the two speakers. In effect, an equilateral triangle is formed, with the angle between the two speakers around 60 degrees as seen from the listener's point of view. In 1958, the first group of mass-produced stereo two-channel records was issued, by Audio Fidelity in the USA and Pye in Britain, using the Westrex "45/45" single-groove system. Whereas the stylus moves horizontally when reproducing a monophonic disk recording, on stereo records, the stylus moves vertically as well as horizontally. One could envision a system in which the left channel was recorded laterally, as on a monophonic recording, with the right channel information recorded with a "hill and dale" vertical motion; such systems were proposed but not adopted, due to their incompatibility with existing phono pickup designs (see below). In the Westrex system, each channel drives the cutting head at a 45-degree angle to the vertical. 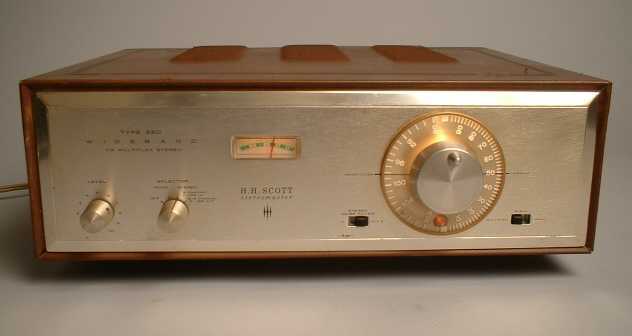 During playback, the combined signal is sensed by a left-channel coil mounted diagonally opposite the inner side of the groove and a right-channel coil mounted diagonally opposite the outer side of the groove. The Westrex system provided for the polarity of one channel to be inverted: this way large groove displacement would occur in the horizontal plane and not in the vertical one. The latter would require large up-and-down excursions and would encourage cartridge skipping during loud passages. The combined stylus motion is, in terms of the vector, the sum and difference of the two stereo channels. Effectively, all horizontal stylus motion conveys the L+R sum signal, and vertical stylus motion carries the L−R difference signal. The advantages of the 45/45 system are that it has greater compatibility with monophonic recording and playback systems. A monophonic cartridge will reproduce an equal blend of the left and right channels, instead of reproducing only one channel. Conversely, a stereo cartridge reproduces the lateral grooves of monophonic recording equally through both channels, rather than one channel. Also, it gives a more balanced sound, because the two channels have equal fidelity as opposed to providing one higher-fidelity laterally recorded channel and one lower-fidelity vertically recorded channel. Overall, this approach may give higher fidelity, because the "difference" signal is usually of low power, and is thus less affected by the intrinsic distortion of "hill and dale"-style recording. This system was "invented" by Alan Blumlein of EMI in 1931 and was patented the same year, but it was not reduced to actual practice, as was a requirement for patenting in the U.S. and elsewhere at that time (Blumlein died during combat in WW-II). EMI cut the first stereo test discs using the system in 1933, but it was not applied commercially until a quarter of a century later, and by another company (Westrex). Stereo sound provides a more natural listening experience, since the spatial location of the source of a sound is (at least in part) reproduced. In the 1960s, it was common practice to generate stereo versions of music from monophonic master tapes, which were normally marked "electronically reprocessed" or "electronically enhanced" stereo on track listings. These were generated by a variety of processing techniques to try to separate out various elements; this left noticeable and unsatisfactory artifacts in the sound, typically sounding "phasey". However, as multichannel recording became increasingly available, it has become progressively easier to master or remaster more plausible stereo recordings out of the archived multitrack master tapes. The Red Book CD specification includes two channels by default, and so a mono recording on CD either has one empty channel, or else the same signal being relayed to both channels simultaneously. In FM broadcasting, the Zenith-GE pilot-tone stereo system is used throughout the world. Because of the limited audio quality of the majority of AM receivers, and also because AM stereo receivers are relatively scarce, relatively few AM stations employ stereo. Various modulation schemes are used for AM stereo, of which the best-known is Motorola's C-QUAM, the official method for most countries in the world that transmit in AM stereo. More AM stations are adopting digital HD Radio, which allows the transmission of stereo sound on AM stations. For Digital Audio Broadcasting, MP2 audio streams are used. DAB is one of the Digital Radio formats that is used to broadcast Digital Audio over terrestrial broadcast networks or satellite networks. DAB is extended to video, and the new format is called DMB. For analog TV (PAL and NTSC), various modulation schemes are used in different parts of the world to broadcast more than one sound channel. These are sometimes used to provide two mono sound channels that are in different languages, rather than stereo. Multichannel television sound is used mainly in the Americas. NICAM is widely used in Europe, except in Germany, where Zweikanalton is used. The EIAJ FM/FM subcarrier system is used in Japan. For Digital TV, MP2 audio streams are widely used within MPEG-2 program streams. 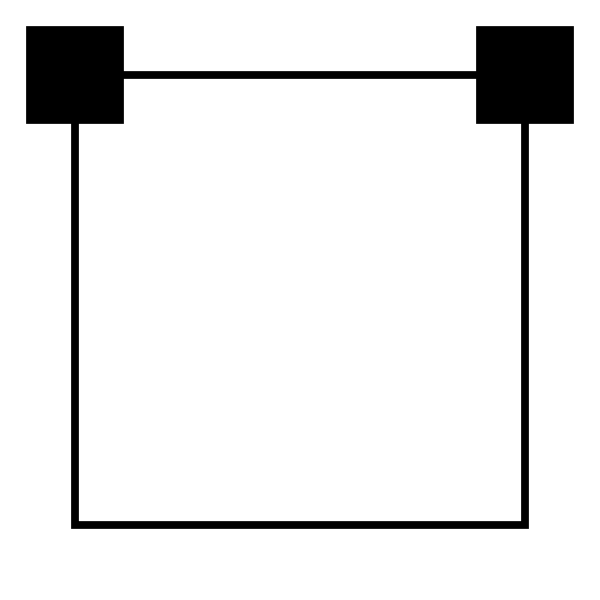 Label for 2.0 sound (stereo). In common usage, a "stereo" is a two-channel sound reproduction system, and a "stereo recording" is a two-channel recording. This is cause for much confusion, since five (or more)-channel home theater systems are not popularly described as "stereo". It is thus worth noting that most film soundtracks are not recorded using stereo techniques; so while they are capable of stereo reproduction, most home theater systems are rarely called upon to do this. Classical music recordings are a notable exception. They are more likely to be recorded "live", so that the actual physical and spatial relationship of the musicians at the time of the original performance is preserved on the recording.